Veterans are part of every generation. Senior citizens remember WWII, middle-aged people fought in Vietnam, and younger men and women are recovering from the Gulf War and the current occupation of Iraq. Children are touched by war when they hear stories of their grandparents experiences and watch their own parents sent overseas. The author is internationally acclaimed as a writer of books for children and young adults, including Strange Objects, Angels Gate, and The Watertower. In this poignant book, he asks readers to acknowledge those who have served, recognize those who have died, and perhaps most importantly, think about how the individuals serving their country are remembered. The boy is outraged that the tree is threatened. He needs the tree to remind him of a whole aspect of who his grandfather and his father, both war veterans, are-they represent his own lineage. The boys parents get in on the conversation, reminiscing about when all the kids used to play under, in, and around the tree. The boy argues that the tree should be saved not only because its a living memorial but also because it is home to so many living things. Old Pa says that the “big boys,” the bureaucracy, will win every time in matters like this but that doesnt mean that the individuals are forgotten. Memories, unlike people or trees, will live forever. The illustrator, a young artist and writer, has won numerous awards for his books, which include The Red Tree, The Lost Thing, and The Rabbits (with John Marsden). 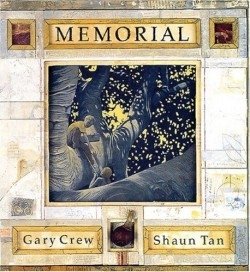 Named the best artist at the 2001 World Fantasy Awards in Montreal, Canada, Tan weaves patterns, textures, and images with line drawings into detailed homages to his subject. The effect is such that the whole book reads like a giant collage wrapped around the memorial tree. The subtlety grants children a sensory experience of wars individual impact without gore or conflict. The readers must fill in the blanks and create their own focus. It is a stunning way to present this difficult material.